Eucalyptus trees have been grown in Thailand for thousands of years, but only since the 1960s on a plantation scale. They are easily grown, have a good servival rate and tolerant to disease and climate change, these facts make this material sustainable. 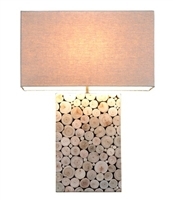 this lamp is made of different size slices of Eucalyptus wood that is manually glued and nailed to the base in a Mosaic like manner, making sure that each piece is purfictly placed. Then topped with a natural linen shade. 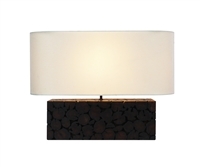 Fan table lamp is made of Natural Tree Branch that is crafted uniquely in the shape of a Fan. The workmanship on such an item is impeccable. Extremely talented craftsman spent many hours creating this beautifully sculptured masterpiece. Fan Console lamp is made of Natural Tree Branch that is crafted uniquely in the shape of a Fan. 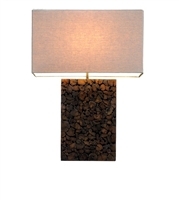 Hygee is a Danish term that means a sense of warmth and coziness and belonging in a certain place, This table lamp gives you all that and more. Made of solid tree branch that was sanded and polished to show its true textures and beauty.